Several weeks ago I asked my mother-in-law to save her empty paper towel rolls, so that I could gather approximately 6-10 more quickly than if gathering on my own. Why, you may ask? B has been very interested in cars, and I have been wanting to improve his independence and safety with ascending/descending our stairs. 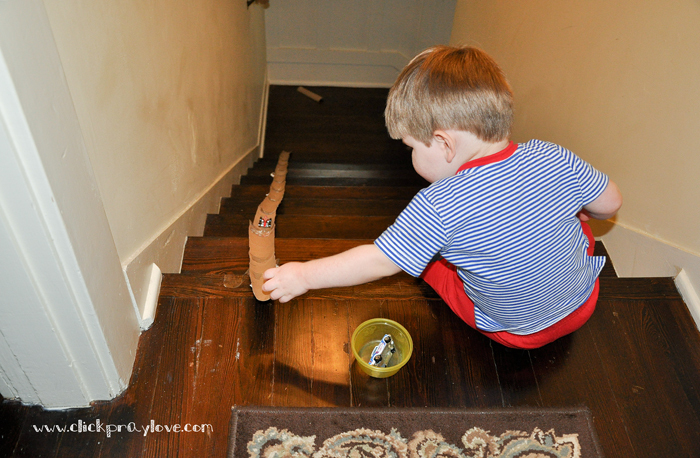 Therefore, I decided to make a downhill slide out of paper towel rolls, so he could have fun sending his matchbox cars downhill all while working on his climbing gross motor skill and his stair safety. Plus, this is a great rainy day activity. Sorry to state the obvious, but I have learned I have to. DO NOT LEAVE YOUR CHILDREN UNATTENDED during this activity. You know your child, so use common sense and do not give him/her small objects that he/she can not play with appropriately (i.e. put in mouth, throw, etc.). I am fortunate that my almost 23 month old rarely puts objects in his mouth, but I realize some children are not safe with small objects until 3+. You know what your child can and can not do, so don't complete this activity unless you know he/she is able to do so safely. Tape each half together, so the uphill piece is always above the downhill piece. Use a smooth tape like clear masking tape. 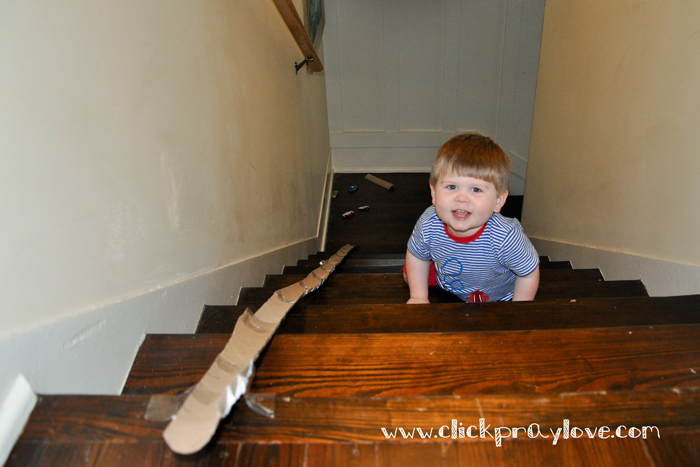 Tape the downhill slide to the top step if you have hardwood. If you have carpet, you will have to come up with another alternative to keep the slide in place. 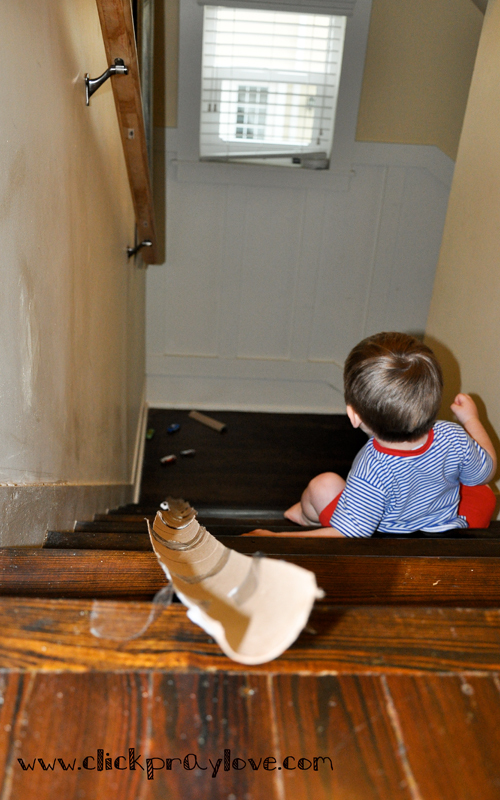 At the bottom, I had him gather his cars and safely carry them back up the stairs while following him. He has been able to ascend the stairs with ease for months; however, I still do not allow him to do it alone. This particular day he had pockets in his shorts, but since that time my husband has given him a small bag with a zipper that he can easily use to carry the cars up the stairs safely. I will admit B has not been ascending/descending the stairs every time. 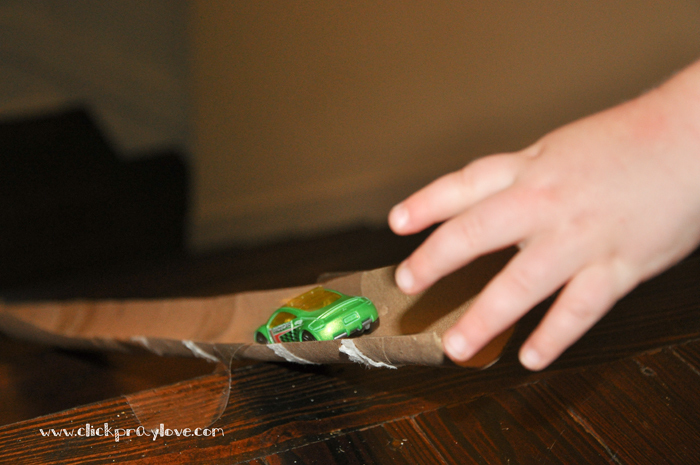 We have 7 matchbox cars (I think), so he can send those down the slide fairly quickly. I encourage him to climb up and down a few times and then I go and get them for him, or daddy is at the bottom and he tosses them back up the stairs to me. I would definitely recommend this activity, but like so many other handmade activities it is not very sturdy. 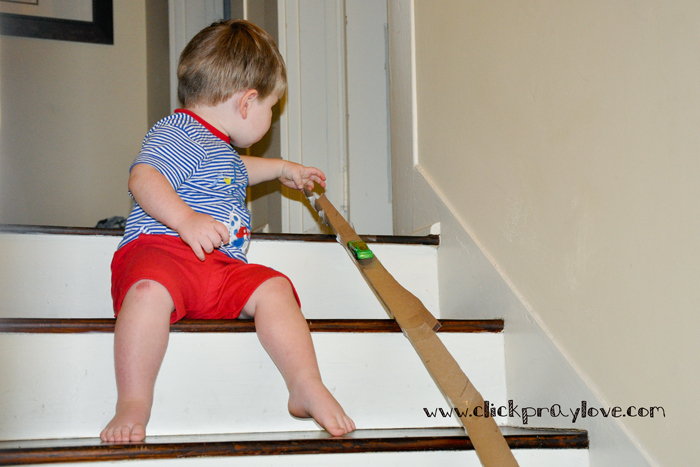 We are still playing with our slide, but next time I will try to re-enforce the whole sliding surface (from the top of the stairs to the bottom) with one long piece of tape. The cars occasionally get caught on the small pieces of tape holding each half roll together and I have to smooth it down. B is still asking to play with his cars on the slide every day!! 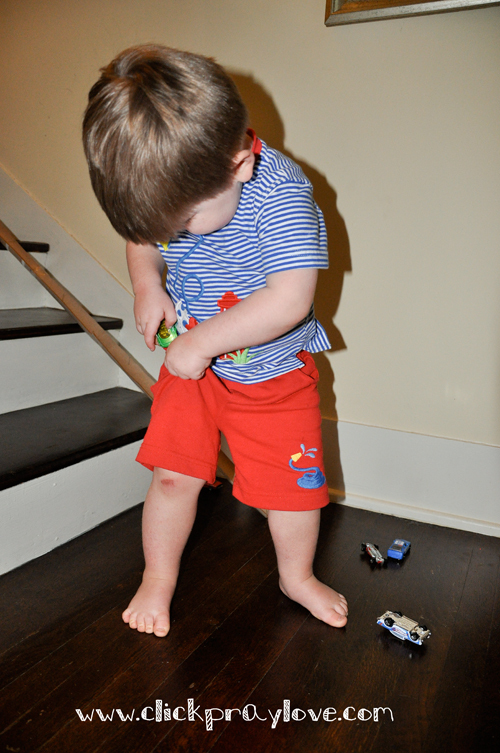 Tip #13: Think about your child's gross motor skills (ie. walking, running, climbing, jumping, etc.). How can you facilitate improvement with these activities? 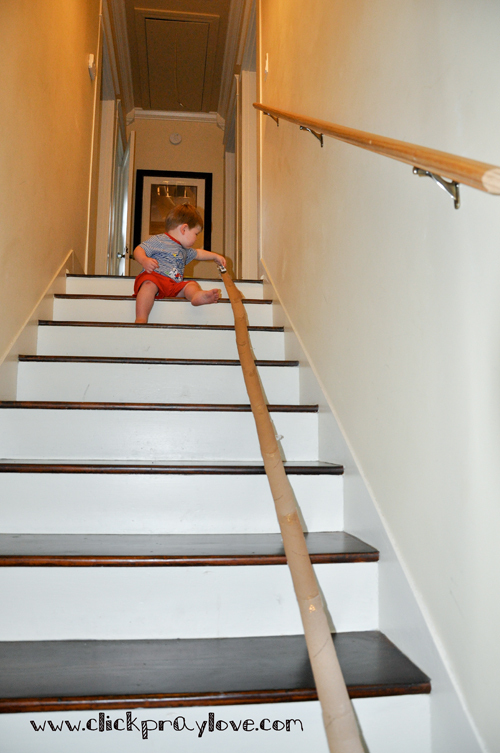 Consider their current interests and try to incorporate them into their gross motor activities, as I have done with the Paper Towel Roll Slide. That sounds like so much fun. Unfortunately we don't use paper towels much. It would literally take years for us to gather that many rolls. You have any other suggestions? Perhaps i should try tissue paper rolls instead? Our house has stairs, but their outside so this wouldn't be a rainy day activity, plus we live in washington which means its cold and rainy here A LOT!!! I hope I'll remember this for the summer time though because its a great idea!!! This is such a fun idea, Amber! I'm going to have to remember to look back at all these posts you've done so I can use them for Landon when he is older. To the previous comment- you could use wrapping paper rolls saved from Christmas, and probably wouldn't need but a couple to make a long slide. This is funny because while I was reading this, I was thinking, "Hm, I bet my boyfriend would really like this." So not only is it an awesome idea for toddlers...it's good for men in their 20's as well! Seriously? You are such a thoughtful, intentional mom. Bennett and baby c are two blesses peeps! You continue to amaze me! This is such a cute idea!! I will have to try this with the nephews! How fun! Very cute. We have a set of stairs this will be perfect for!